Keep in mind, that there is no known vaccine, they say that you can be saved by blood transfusions. They have also found that the blood of survivors is for sale on the black market. So, if you survive Ebola, chances are good that you will be abducted, and your blood stolen from you. That still might not be as bad as dying from Ebola, having all your blood removed, you just fall asleep. King Obola opened up the borders, allowing sick and diseased persons from anywhere and everywhere invade our country. He then allows people from anywhere and everywhere to fly into our country. The BK and other countries have banned flights. He brought Ebola into this country with the first two cases here, one taken to Atlanta. Now, the hospital in Dallas, turns away a man, from Liberia, who shows symptoms of Ebola, and allows him to wander around in Dallas for four days. He was in contact with at lease 80 people so far. Now, he is dying in the hospital in Dallas, but has infected children who attend four different Dallas schools. Ebola Patient “Zero” is now identified as Thomas Eric Duncan, pictured above, Mr Duncan carried his landlord’s sick daughter to a Liberian hospital on September 15, and boarded a flight bound for the U.S. four days later. The pregnant woman Mr Duncan carried to the hospital, her brother and three neighbors later died of the disease But Mr Duncan wasn’t showing any signs of the virus when he boarded a plane on September 19 (most likely from Roberts International Airport, pictured right on August 27), and was therefore allowed to fly all the way to Dallas, Texas where he became the first patient diagnosed with the disease on U.S. soil. Mr Duncan’s family are among up to 80 people being monitored after exposure to the man along with the ambulance crew who transported him to hospital. Five of those being monitered are students that attended four different Dallas schools this week after possibly being in close contact with the Ebola patient over the weekend. Now to Hawaii, the Department of Health has confirmed a patient is currently in isolation and undergoing testing in Honolulu. The Hawaii Nurses Association said the person is being treated at The Queen’s Medical Center. Officials told KHON2 Ebola is a possibility, however the unnamed patient has yet to be specifically tested for the virus. Dr. Viray said the patient could have a number of illnesses including Ebola, flu, malaria and typhoid. Dr. Viray wouldn’t confirm any details about the patient, symptoms, or if the person had recently traveled to West Africa. But she did say red flags for Ebola include fever and recent travel to that area. “Why is this person being isolated?” KHON2 asked. “What we’ve asked the hospitals to tell us about is anyone with a travel history, and anyone with a fever. And when those things come together, we’ve asked them to be very careful and in an abundance of caution while you’re working, for whatever else might be going on, also make sure you isolate against Ebola, just in case,” she said. “So it sounds like this person does have a fever and recently traveled to West Africa,” KHON2 asked. “Again, I can’t be the one to confirm that,” Dr. Viray said. The patient is currently being kept in a regular room, and anyone who goes in or out must wear protective gear, officials said. “They’re monitoring who goes in and out of that room, and making sure that everybody is as safe as possible, while the patient is being evaluated for Ebola and what other conditions that patient might have,” Dr. Viray said. Below you will see 3 videos, the first one is an interview with Mike Adams with NaturalNews.com, Mike walks us through the chain of events that have led to Ebola being allowed in the U.S. and what we can expect in the days to come. The second video brings to light many inconsistentcys in how the first Ebola case was handled, as you will see it’s very troubling. The third video is a update from Sierra Leone, where new infections in that country are spreading to 5 new people every hour and could rise to 10 every hour by the end of October! 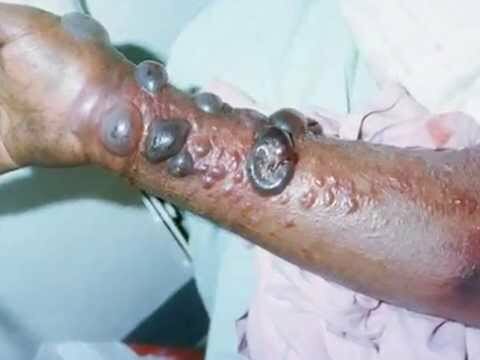 last is what to expect when Ebola enters the human body, once infected. As Mike Adams also explains below, how the Ebola virus thrives in winter conditions and darkness. Not only did Patient Zero come Liberia and inform staff of this, he also handled a person who not only had Ebola before he left Liberia, but stayed with them till they died also! But there is more in this next video. It takes up to 21 days for symptoms of the deadly virus to show. The death toll in West Africa from the latest Ebola outbreak has passed 3,300. 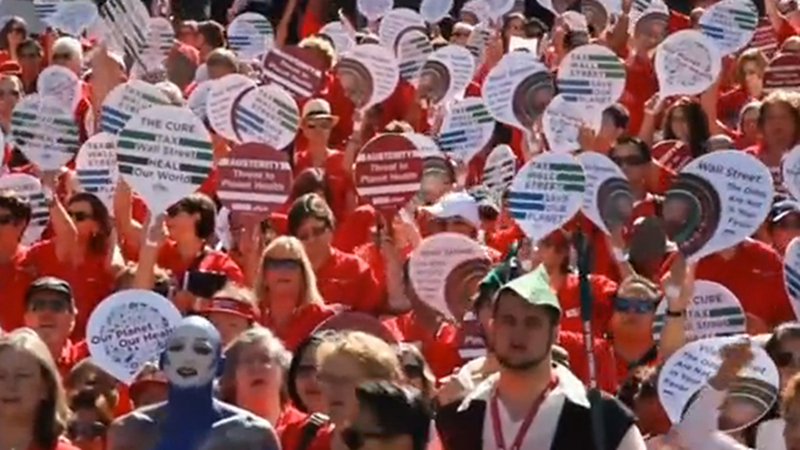 Nurses recently protested in Las Vegas, saying they are not trained to treat Ebola patients. Surveys show many Americans are afraid the Ebola virus might spread inside the U.S.
A leading charity has warned that a rate of five new Ebola cases an hour in Sierra Leone means healthcare demands are far outstripping supply. Save the Children said there were 765 new cases of Ebola reported in the West African state last week, while there are only 327 beds in the country. Experts and politicians are set to meet in London to debate a global response to the crisis. It is the world’s worst outbreak of the virus, killing 3,338 people so far. There have been 7,178 confirmed cases, with Sierra Leone, Liberia and Guinea suffering the most. Save the Children says Ebola is spreading across Sierra Leone at a “terrifying rate”, with the number of new cases being recorded doubling every few weeks. It said that even as health authorities got on top of the outbreak in one area, it spread to another. The scale of the disease is also “assively unreported” according to the charity, because “untold numbers of children are dying anonymously at home or in the streets”. “We’re in a race against time,” said Justin Forsyth, the organisation’s chief executive. Speaking on the BBC’s Today programme he said that the figure for Sierra Leone could rise to 10 people every hour before the end of the month if urgent action were not taken. Americans have a right to be worried, this disease is already spreading out of control in the countries where it all started. There was a lot of good information on what you can do to strengthen your immune system to prevent the spread of the disease. People should be preparing for the worst and hope for the best. This is one disease we cannot take for granted. How our government ever allowed this to happen is unforegivable. From Mike Adams NaturalNews, Throughout the course of human history, governments — even those that claimed to be benevolent — have killed millions of their own people in horrible fashion through the use of what were essentially weapons of mass destruction. A new historical review by Dr. Stefan Riedel, MD, PhD, for Baylor University Medical Center documents some of those uses, but there are other examples as well that Natural Newsfound in its own research. Dr. Riedel’s review was spurred in part by the continuing threat of global terrorism and, in some current conflicts, the use of weapons of mass destruction against civilian populations. But in addition to the standard threats — chemical and conventional weapons – there should be additional concerns about non-traditional, biological threats, and the current deadly Ebola virus outbreak serves as a reminder that pandemics can also be unleashed on populations as a means of decimating them. Because of the increased threat of terrorism, the risk posed by various microorganisms as biological weapons needs to be evaluated and the historical development and use of biological agents better understood. Biological warfare agents may be more potent than conventional and chemical weapons. In the past century especially, there has been substantial progress in the fields of biotechnology and biochemistry, progress that has “simplified the development and production” of biological and chemical weapons. Also, Dr. Riedel’s review found that the field of genetic engineering is most likely the deadliest of all. The techniques of delivery and weaponization of biological warfare agents have gradually evolved from the catapulting of plague victims to the deliberate use of infected clothes, insect vectors, and specialized weapon systems. “The crude use of filth and cadavers, animal carcasses, and contagion had devastating effects and weakened the enemy,” Dr. Riedel’s review added. Another tactic adopted by warring factions was the poisoning of water sources of the opposing military force — a tactic that was continued often through the many European wars, as well as the American Civil War. The tactic has been used into and throughout the 20th century as well. Middle Ages and more technological advances. Military tacticians and leaders during the Middle Ages understood that bioweapons — infectious diseases — could be deployed against opposing armies and their supporting civilian populations. For example, in 1346 during the siege of Caffa, a strongly fortified seaport controlled by the Genoese (now, the region is known as Feodosia, which is in Crimea, recently annexed by Russia), the assaulting Tartars fell victim to a plague epidemic. But the Tartars used it to gain military advantage; they catapulted cadavers of the deceased into the city, which then led to an outbreak of plague there. That forced the Genoese forces to retreat. An epidemic of plague, known also as the Black Death, followed and continued to sweep through Europe, the Near East and North Africa during the 14th century. It has been called the worst pandemic in recorded history. “The siege of Caffa is a powerful reminder of the terrible consequences when diseases are used as weapons,” said the review. The 14th century plague killed more than 25 million Europeans, and there were other instances where disease and poisons were used during warfare, the historical review said. In more recent times, other diseases have been used as biological weapons, most notably smallpox. Francisco Pizarro, for instance, reportedly gave native South Americans disease-contaminated clothing in the 15th century; also, during the French and Indian War in North America, the commander of British forces, Sir Jeffrey Amherst, suggested that the smallpox virus should be deliberately introduced into the Native American population hostile to the Crown, as a way of diminishing resistance. On June 24, 1763, Captain Ecuyer, one of Amherst’s subordinate officers, provided the Native Americans with smallpox-laden blankets from the smallpox hospital. He recorded in his journal: “I hope it will have the desired effect.” As a result, a large outbreak of smallpox occurred among the Indian tribes in the Ohio River Valley. World War I saw the first industrialized use of chemical warfare — which was eventually banned by international treaty — but there was also talk of usingbiological warfare. German military planners considered shipping horses tainted with the anthrax and glanders bacteria to the United States and other allied countries. Also, “the same agents were used to infect Romanian sheep that were designated for export to Russia,” the review said. Germany was also suspected of making plans to send cholera to Italy and plague to parts of Russia. A League of Nations committee cleared Germany of any biological warfare in 1924 but noted that the country used chemical warfare. Various allegations and countercharges clouded the events during and after World War II. Japan conducted biological weapons research from approximately 1932 until the end of World War II. The program was under the direction of Shiro Ishii (1932-1942) and Kitano Misaji (1942-1945). Several military units existed for research and development of biological warfare. More than 10,000 prisoners were believed to have died during their captivity in Japanese prison camps as a result of experimentation with biological warfare agents. After World War II, biowarfare programs expanded, and that included programs in the United States, but these also involved research into countermeasure programs aimed at defeating a biological attack. By 1972, however, most nations signed onto a UN-sponsored treaty, the “Convention on the Prohibition of the Development, Production, and Stockpiling of Bacteriological (Biological) and Toxin Weapons and on Their Destruction,” which bans development and deployment of biological weapons. As recently as the first Gulf War in 1991, however, there were fears that biological weapons could be employed during combat. “Coalition forces prepared in 1990-1991 for potential biological and chemical warfare by training in protective masks and equipment, exercising decontamination procedures, receiving extensive education on possible detection procedures, and immunizing troops against potential biological warfare threats,” Dr. Riedel’s review said. Since then, research into bio-agents has continued, as global terrorism fears multiply with the rise of numerous non-state actors. Even today, the Federal Emergency Management Agency, the Department of Homeland Security and the Pentagon’s NORTHCOM (Northern Command, which is responsible for protecting the U.S. homeland), have all warned that biological warfare is still a very real possibility. Officials cite the immediate post-9/11 incidents in 2001 involving anthrax spores sent to targets through the mail as examples. Once the virus enters the body, it targets several types of immune cells that represent the first line of defense against invasion. It infects dendritic cells, which normally display signals of an infection on their surfaces to activate T lymphocytes—the white blood cells that could destroy other infected cells before the virus replicates further. With defective dendritic cells failing to give the right signal, the T cells don’t respond to infection, and neither do the antibodies that depend on them for activation. The virus can start replicating immediately and very quickly. Ebola, like many viruses, works in part by inhibiting interferon—a type of molecule that cells use to hinder further viral reproduction. In a new study published today in Cell Host & Microbe, researchers found that one of Ebola’s proteins, called VP24, binds to and blocks a transport protein on the surface of immune cells that plays an important role in the interferon pathway. Curiously, lymphocytes themselves don’t become infected with the virus, but a series of other factors—a lack of stimulation from some cells and toxic signals from others—prevent these primary immune cells from putting up a fight. How does Ebola cause hemorrhaging? As the virus travels in the blood to new sites, other immune cells called macrophages eat it up. Once infected, they release proteins that trigger coagulation, forming small clots throughout the blood vessels and reducing blood supply to organs. They also produce other inflammatory signaling proteins and nitric oxide, which damage the lining of blood vessels, causing them to leak. Although this damage is one of the main symptoms of infection, not all patients exhibit external hemorrhaging—bleeding from the eyes, nose, or other orifices. Does the virus target certain organs? Ebola triggers a system-wide inflammation and fever and can also damage many types of tissues in the body, either by prompting immune cells such as macrophages to release inflammatory molecules or by direct damage: invading the cells and consuming them from within. But the consequences are especially profound in the liver, where Ebola wipes out cells required to produce coagulation proteins and other important components of plasma. Damaged cells in the gastrointestinal tract lead to diarrhea that often puts patients at risk of dehydration. And in the adrenal gland, the virus cripples the cells that make steroids to regulate blood pressure and causes circulatory failure that can starve organs of oxygen. What ultimately kills Ebola patients? Damage to blood vessels leads to a drop in blood pressure, and patients die from shock and multiple organ failure. Why do some people survive infection? Patients fare better with supportive care, including oral or intravenous rehydration that can buy time for the body to fight off infection. But studies on blood samples from patients during the 2000 outbreak of a different Ebola strain in Uganda have also identified genes and other markers that seem to be predictive of survival. Patients who recovered had higher levels of activated T cells in their blood and had certain variants of a gene that codes for surface proteins that white blood cells use to communicate. Earlier this year, researchers found a new association between survival and levels of sCD40L, a protein produced by platelets that could be part of the body’s attempt to repair damaged blood vessels. The authors note that markers like sCD40L could suggest new therapies that augment the repair mechanisms most important for survival. *Correction, 15 August, 1:51 p.m.: This article has been corrected to note that nitric oxide, not nitrous oxide, damages blood vessels. This is a must read link: The Report Global To The President 2000. Author Jimmy Carter! It reads like something right out of the movie “Outbreak” Could this all have been planned? UPDATE: This video from Sept 9th tells the rest of the story!